AR12738 - CaH - SolarChat! This spot is becoming popular notwithstanding the recent predictions for a deep and long solar minimum I very much hope to see other spots like this one. Today I succeeded to take one image with my 100ED, again between clouds with some apertures lasting enough to allow some work. Thanks for looking. Last edited by krakatoa1883 on Sun Apr 14, 2019 11:09 am, edited 1 time in total. That's an excellent closeup Raf! 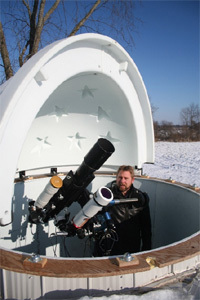 It's nice to see you getting sme good results with this scope, I know bob yoesle gets good images too in the blue end. It's one that's on my potential radar. Very nice close view in CaH, Raf. The image is quite good. It seems to me that there is a shift in the center wave length ? Or maybe an artefact due to the passing clouds ? Thanks, Christian. Yes, I am experimenting with different tunings as this is a useful feature of the Quark, for this image I set the knob at 0 while the best position would be at -5. Nice one Raf! What exposure time are you using with this set up? Top rate, very nice captures Raf. I imaged at 30 fps (33ms per frame), 150 frames stacked. It's one that's on my potential radar. it's a good scope indeed, not only for solar. However I think that for calcium imaging a long focus achromat would be even better. I am trying a Tecnosky 102mm f/11, curious to see if can beat the ED. 33ms, that is surprisingly long. I did not think it was possible to get sharp images with such a long exposure time. Have to try that myself. Yes, at max image size it's quite long, usually I try to keep it within 20ms. However the camera works so fine (low noise, no NR, insensitive to dust) that I reluctant to change it. May be next year I will consider to purchase a Basler.